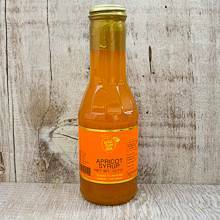 Sugar Plum Farm Apricot Syrup 12 oz. Tired of traditional syrups? Try this sweet apricot syrup! It is great with pancakes or as a tasty topping on ice cream. Net Wt. 12 oz. Ship Wt. 1.5 lbs. 8/31/2011 – What is the recipe for the dip or dressing using the apricot syrup? We like to use it over fresh fruit, but I have forgotten . . .